Pedestrians are warned to stay off a stretch of Blackhead Path in Whitehead due to serious safety concerns caused by further subsidence. The first section of the entrance point to the path on the Old Castle Road is being shut with immediate effect. 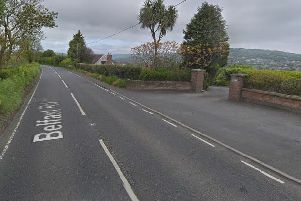 The additional damage, council stated, may have been caused by extreme weather which hit Northern Ireland last weekend, resulting in a month of rainfall landing in the space of several hours on Saturday. The path has moved 30cms in the last year and, more significantly, 17cms in the last month. Large cracks along the path wall have also been identified, indicating likely structural failure of it and possible collapse. The path was previously closed to vehicles and the latest move is to safeguard pedestrians. A MEA Council spokesman said: “The health and safety of our residents and visitors to our borough is paramount. We take no chances whatsoever when it comes to people’s safety and wellbeing, and we have immediately closed access to this section of the path as a result. We understand and appreciate that this will be frustrating for those who enjoy this outstanding coastal path. “We will be continuing to work closely with residents and the local community, including Blackhead Path Preservation Society, until this situation is rectified. “We know this is an inconvenience, but in the meantime we would encourage the public to explore and enjoy nearby alternative walking opportunities in the area, including Diamond Jubilee Wood, Whitehead Recreation Ground, Beach Road Nature Reserve and Bentra golfing facilities. An area of the path around the lighthouse was closed a few years ago after severe rockfall and subsidence, and further storms have worsened the damage. Fences and signs warning people of the risks have already been erected, but a small number have ignored them previously, cutting away and damaging fence posts and locks. Members of the public have been warned by the local authority these actions pose serious risks should they access the path in its current state. The spokesman added: “Substantial funding has already been set aside by council for major investment works at Blackhead Path. Council is currently engaged with a project team to design and oversee those remedial works. East Antrim DUP MLA Gordon Lyons said he was sorry to learn of this setback in plans to have the facility restored.